Blue! Did you know blue was a popular wedding dress colour from Roman times right up to the late 19th century? A blue dress historically symbolised love, fidelity and modesty. From deepest navy blue to baby blue, a bride has so many devine shades to choose from. 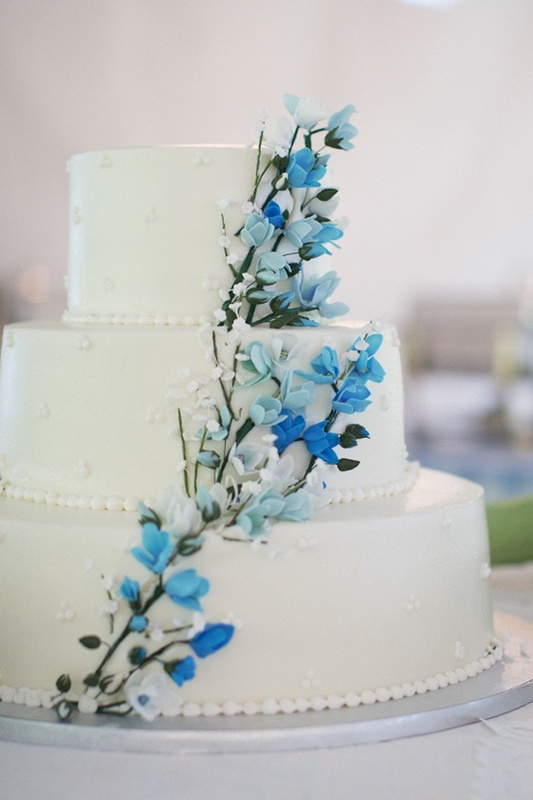 For a spring/summer wedding I think paler shades are beautiful, like Tiffany blue. Keira Knightley really looks magical in this dress don't you think? Martha Stewart, the wedding guru, shows us that the paler shades of blue definitely are a key highlight for 2013. If a blue gown is a step too far why not consider accessorising your white or ivory gown with blue instead? Jewellery and headbands or tiaras with blue crystals can look stunning. For me, one of the best contrasts can be made with your shoes - girls you can really go to town especially if you wear a 50's style dress!! I had to show you these Jimmy Choo shoes - who wouldn't wear snakeskin killer heels like these? Flowers for a blue wedding theme can be tricky as there are only a few true blue flowers grown in the UK - here are my two favourites. It may be worth considering fake flowers for table arrangements as they can look so realistic; plus you have a table keepsake which guests can take home. I hope that these photos give you food for thought - let us know! Published on November 01, 2012 by Mary Jeremiah.